Seared Cod & Summer Succotash is simply irresistible. This Blue Apron recipe doesn’t call for much seasoning yet packs a punch full of flavor. And, it’s easy to prepare. Blue Apron recommends the estimated prep time for each meal. However, I’ve yet to meet or even beat this time. It takes me forever to wash the produce, chop, peel, and prep the ingredients. I was able to save some time this go round using my handy prep bowls and chopping board. Having organization in the kitchen helps! I invested in a few kitchen tools to aide in the prep work. I also watched the clock closely and it took me about 40 minutes to get everything together and in the skillet. For the first time in life, I pickled grapes. The thought never occurred to me before. I don’t even like red grapes. I’m such a picky eater. Well, something about soaking the red grapes in white wine vinegar with a bit of sugar propelled the sweet tangy flavor and created a love affair with my taste buds when combined with garlic and scallions. Fairy Tale Eggplant is a staple in Blue Apron recipes. I’ve never been a fan of this either. Eggplant has always been so ‘meh’ to me. However, Blue Apron has changed my perspective in short order. We’ve become acquainted and our relationship is working out nicely. Now, when I see the eggplant in the recipe, I don’t cringe knowing it will soak up the delicious flavors of the recipe. After cutting corn off the cob, splitting green beans, slicing grapes, chopping scallions, and dicing fairy tale eggplant and tomatoes it was time to fire up the skillet to cook the seared cod & summer succotash. I was tired at this point. So, I didn’t follow the instructions precisely here and went ahead and cooked all the vegetables together instead of in parts like suggested in the recipe. Once they finished, I placed them in a prep bowl while the cod seared. Next time, I may just pop the cod on my Foreman grill so everything is done at once. The cod wasn’t really flaky and the dip into the rice flour was a pasty mess. I didn’t season the cod well because I wanted to taste it following the recipe. It lacked flavor and needed more work. I usually put lemon on all my fish or add a bit of spice or lemon dill sauce. Overall, I enjoyed this meal and have plenty left over for lunch tomorrow. Check out more of my adventures with Blue Apron over here and here. Have you tried Seared Cod & Summer Succotash before? Leave me a comment below. Back in the kitchen with another Blue Apron recipe. This time I'm making Seared Cod & Summer Succotash. This meal is delicious. 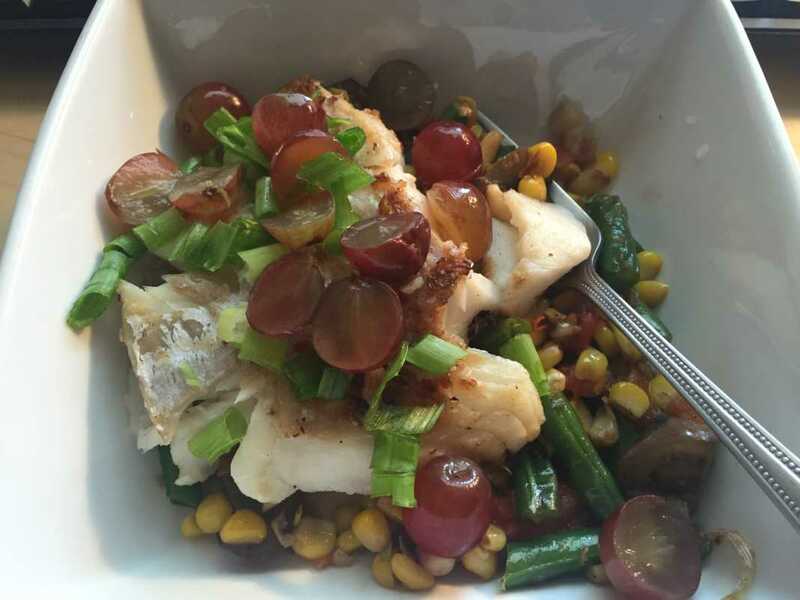 I had to work on the cod a bit to give it some flavor but the succotash is a stunner! Thanks for watching my little cooking video as I experiment in the kitchen while traveling.